I'm sure you're all familiar with John MacArthur's message "Why Every Self-Respecting Calvinist Is a Premillennialist," which he delivered at the 2007 Shepherd's Conference. To say that it made quite a stir in the blogosphere would be a huge understatement. 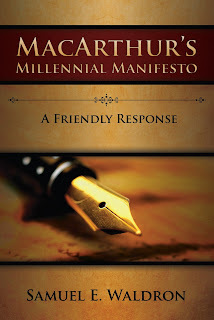 Well, someone has provided us with a cogent answer to that speech in the form of a new book entitled MacArthur's Millennial Manifesto: A Friendly Response. "In this book," writes Jason Robertson, "Dr. Sam Waldron addresses the assertions of MacArthur historically, exegetically and theologically. Although his arguments are rigorous, the entire tenor of the book is level-headed and irenic. This 'friendly response' grants modern day Amillennialists the opportunity to thoughtfully engage their Dispensational brethren." You can pre-order your copy from Reformed Baptist Academic Press.